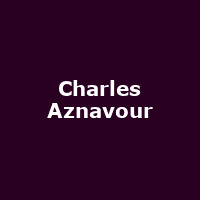 [1924 - 2018] Charles Aznavour was a million-selling, award-winning French easy-listening/ chanson singer, actor and performer whose career started in the '50s. During the 1970s he scored hits with "She" (a number 1) and "Dance in the Old Fashioned Way". His vast career includes dozens of albums and several film roles.